New York is home to many species of sharks, from white sharks and makos to dusky sharks and sandbars. Many species of sharks are prohibited, meaning you can’t harvest or remove them from the water. Make sure you are familiar with the recreational shark regulations. 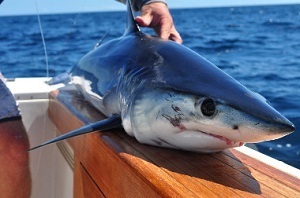 If you can’t identify a shark species, treat it as a prohibited species and release it, or as the National Oceanic and Atmospheric Administration (NOAA) would say, "If you don't know, let it go!" You are required to use non-stainless steel, non-offset circle hooks when shark fishing. You must first register with the NYS Recreational Marine Fishing Registry AND apply for a federal Highly Migratory Species (HMS) permit. Sharks are apex predators (they are at the top of the food chain) and an important part of the marine ecosystem. While fishing, if you don’t intend to keep a shark, it is important to release it in a way that increases its chance of survival. Learn more about the safe handling and release of sharks. 2011 Chasin Tail TV - Latest News from the DEC.